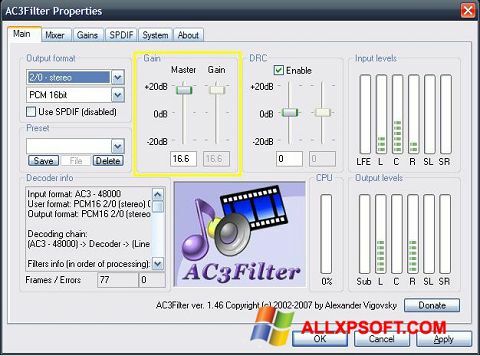 AC3Filter for Windows XP allows you to decode DirectShow, process sound in Real-Time mode. Support for multi-channel tracks and SPDIF output. The program produces DRC compression, provides channel level indication, mixes Pro Logic (versions 1 and 2), Dolby Surround. In the presence of the clipping function, auto gain control. Delays are performed per channel. The user is provided with detailed information about each audio track. You can free download AC3Filter official latest version for Windows XP in English.